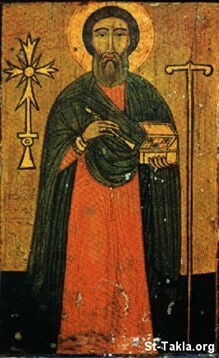 St. Koltas (Colluthus) is one of the Christian physician saints, along with St. Cosmas and Damian and St. Panteleímon. He was born to pious Christian parents in the third century in Egypt. His father was a governor over Antinoe in Upper Egypt, but did not have any children. After praying to our Lord Jesus, God granted him this saint. St, Koltas was raised him in the fear of God and the love of the Church. He was pure from his youth, and desired to live a life of celibacy and consecration to God. All his father’s attempts to get him married failed; St. Koltas’s sister however was married to Arianus who succeeded her dad in becoming governor.